As a relational communication major, you'll learn how to help people manage the personal, social and professional relationships that drive their lives. You'll prepare for work in human resources, conflict management and event planning or be ready to design your own career opportunity in the profit or not-for-profit sectors. You'll learn about conversation and conflict management, listening and gender in contexts such as family, friendship, romance and employment. You'll practice the problem-solving and leadership skills you acquire in internships and intercultural experiences on and off campus. You'll graduate ready to work in a world dependent on effective communication. Diversity in internship experiences through a variety of nonprofits, charitable organizations and businesses. Faculty with established and ongoing research. Professor Eddah Mutua was invited by the Embassy of Rwanda to present her research on women and peacebuilding in Rwanda on the 20th anniversary of the Rwanda genocide. She also earned a 2014 Minnesota State Diversity and Equity Award for her work on a collaborative project between the university and three area school districts. 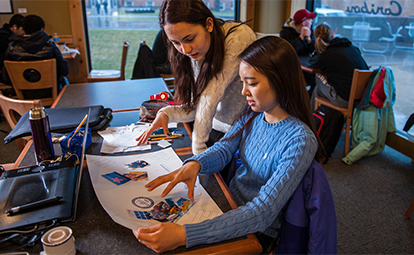 Communication Professor Marla Kanengieter is co-director of the university's branch of the American Democracy Project, which promotes service learning and civic engagement locally and nationally. Notable alumna: Sue McLean '73 built and owned Sue McLean & Associates, the independent concert promotions company that books bands for the Basilica Block Party, the Minnesota Zoo, the Guthrie Theater and Somer Set, before her death in 2013.